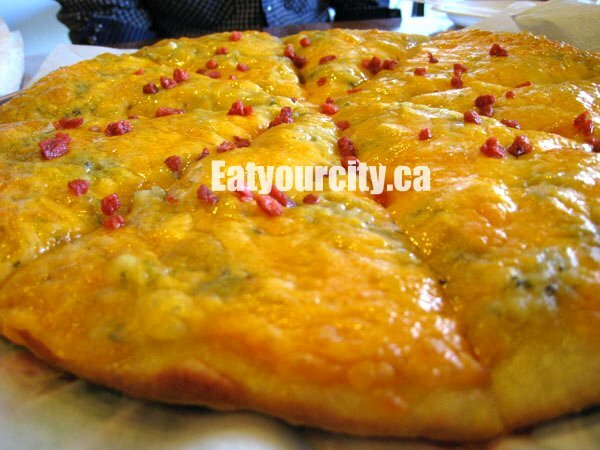 Eat Your City: Pizzeria Prego Edmonton AB Tasty gluten free Celiac friendly pizzas AND a perogi/ pierogy/ perogy/ pierógi/ pyrohy or pyrogy pizza!!! 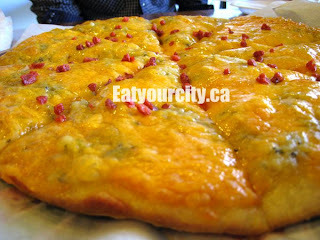 Pizzeria Prego Edmonton AB Tasty gluten free Celiac friendly pizzas AND a perogi/ pierogy/ perogy/ pierógi/ pyrohy or pyrogy pizza!!! We've passed by Pizzeria Prego numerous times on our way to Sushi Wasabi, as its in the same Lendrum strip mall complex. It wasn't until I heard that they not only serve gluten free pizzas (and the only place in Edmonton that does), but ones that taste good, we had to go check it out instead of driving past as we usually do. We called up some friends (but not too many) as we heard the sitting area is small, and walk into a small, cozy space (one table and a small raised eating area by the window) with the air heavy with the scent of garlic, roasting tomatoes, Parmesan and cheese. It's an Italian olfactory heaven... I think I'm in love. Drinks are a small selection of canned pop, juices and water, which we all grab to help wash down our order. 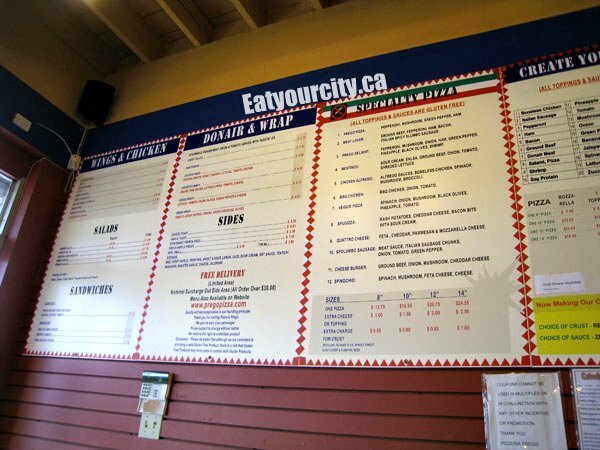 The menu is quite impressive considering all the items are gluten free... pastas, sandwiches, pizza (of course), salads, donairs, wraps... the large wooden menu is posted on a side wall, with most items available to be purchased to bring home in bulk. 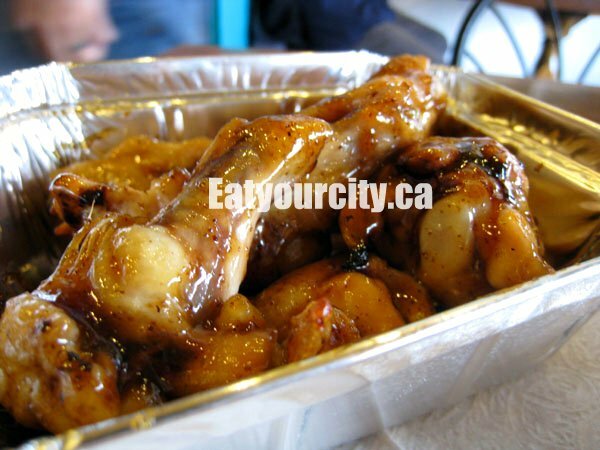 We order an order of honey garlic wings to share as an appetizer - BBQ, teriyaki, jalapeno hot and sweet and sour flavors is also available. For the more health conscious, they bake all their wings, and you can have it made with no oil or sauce as well. The wings were juicy, moist and coated with a sticky honey glaze with a faint hit of garlic.. and nearly took out our palates as they were very very hot temp wise. Points for having a texturally correct pasta and a fresh in house made tomato sauce. However, the tomato sauce speckled with small amounts of ground meat was a bit on the runny and bland side. 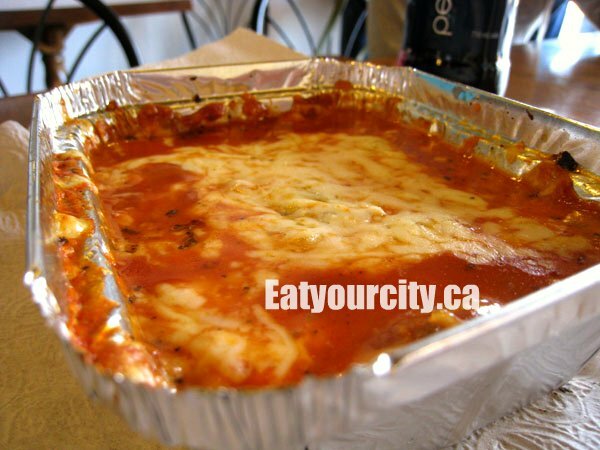 The addition of ricotta cheese, more garlic, more cheese and basil or oregano would have made this lasagna outstanding. We all agreed to coin this "Spidizza" a perogi/ pierogy/ perogy/ pierógi/ pyrohy or pyrogy pizza. Anyway you spell it, this perogy pizza was a hit. Mashed potatos serve as a sauce, topped with oodles of molten cheddar cheese, and dotted with soy flour simulated bacon bits.. despite the unappetizing sounding name, the bacon bits tasted pretty good. The pizza is a bit on the drier side as there isn't any sauce, but there is a small bowl of sour creme you can liberally blob onto your perogy pizza. 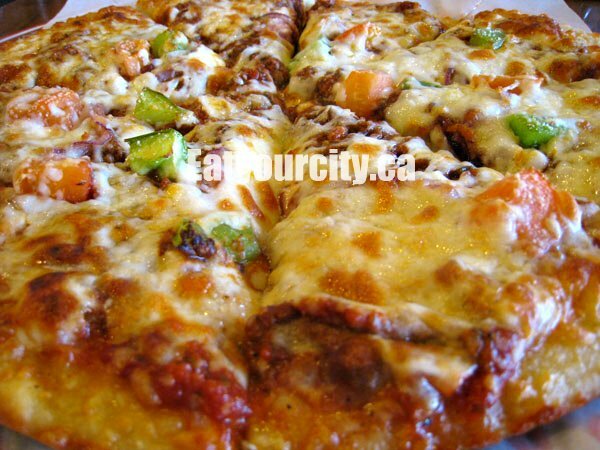 The crust is a medium crust in thickness as its between a standard thin and thick crust pizza. Though not an outstanding crust, its one of the better gluten free pizza crusts I've had a chance to try. We were a bit disappointed with this pizza, as search as we might, we were not able to detect a trace of the spicy beef Spolumbo sausage on this pizza. I think they forgot to add it in. A thin tomato meat sauce is the base with diced onions, small chunks of green peppers and slices of tomato. Without the promised Spolumbo sausage, this pizza didn't really stand out, as the meat sauce used was the exact same bland one used in the lasagna. 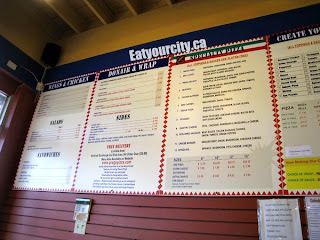 Overall, a good place to grab a unique perogy pizza, and a great place if you're looking for gluten free Italian products. I used to work there, (for a long time) and just to point out a lot of people think that "spolumbo" sausage is some sort of unique/different type of sausage when in reality "spolumbo" is just the name of the place where the sausage is purchased. Just the same as "mundare" sausage, but from spolumbo. I can't quite see the sausage on the pizza, mind you it would be underneath the cheese as opposed to on top. When I used to work there I would cut up the sausage thin and place it all over the pizza like pepperoni, but now (depends on who's working really) they may cut it up thick, and spread it more sparingly. Oh well thats a bummer, it really is quite good and absolutely! That was by far my favorite pizza we had. For anyone who's more into vegetarian pizza I recommend the Spinochio. It has spinach, feta, mushroom, and mozzarella cheese. Anecdotally speaking it was definitely our best seller.